Glenavon continue Ballymena United's miserable start to the season as Eoin Bradley's hat-trick helps the Lurgan Blues earn a thumping Showgrounds win. 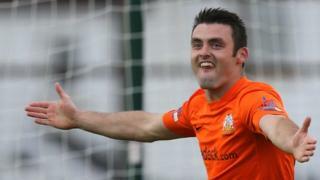 Rhys Marshall poked Glenavon ahead on two minutes with David Elebert, Kevin Braniff and Bradley adding further first-half goals for the visitors. Ballymena sub Matthew Shevlin replied on 52 but Andy Hall ran in a superb fifth Glenavon goal on 66. Bradley ensured his hat-trick with further goals on 70 and 79.